A 48-unit passive housing project is in the works at the former State Street School site in Brewer. Officials from Brewer and several nonprofit groups break ground on a 48-unit apartment complex that is expected to be the largest passive-certified housing development in the country. 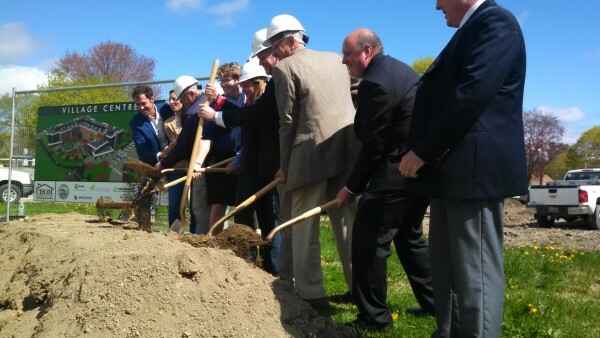 BREWER, Maine — Construction began Wednesday on what’s expected to be one of the largest passive housing projects in the United States. Village Centre Apartments, a 48-unit affordable housing complex, is being built at the former State Street School site. Crews have been doing abatement work there since last year after the demolition of the old school. Passive-certified houses must meet strict energy efficiency standards developed in Germany. Passive buildings are heavily insulated, including triple-paned windows. The idea is to minimize the amount of heat lost from the building in winter months and the amount of heat gained during the summer. That means heating or cooling systems can be used less frequently to adjust to changing temperatures inside the building. Colin Schless of Thornton Tomasetti, the firm managing the passive house certification work, said during Wednesday’s groundbreaking that this would be the largest passive housing development in the country, at least for the time being. Other large projects, including several in Oregon, are in development or planning stages but still don’t reach the scale of the 54,400-square-foot development in Brewer, he said. Schless travels throughout the United States and Europe consulting on projects such as this. The $9.5 million project stems from a complex partnership involving Community Housing of Maine, MaineHousing, the Northern New England Housing Investment Fund, TD Bank and the City of Brewer. In September, the Brewer City Council approved a tax-increment financing deal with Portland-based nonprofit Community Housing of Maine. It reduces the property taxes for an LLC formed under Community Housing of Maine, requiring them to pay 49 percent of the project’s property taxes for the first 15 years after the apartments are completed. Once that time passes, Village Centre Housing Partners will begin paying the full tax bill to the city. Village Centre residents will have to meet certain income eligibility requirements, falling into a bracket of the workforce that typically includes nurses, firefighters and others with similar earning potential, according to Erin Cooperrider, CHOM development director. The three-story building at 266 Center St. will include 21 one-bedroom apartments, 17 two-bedroom apartments and 10 three-bedroom apartments, as well as a community playground and garden and laundry facilities. Contractors on the project include CWS Architects, Bennett Engineering, Becker Structural Engineering and Wright-Ryan Construction. Brewer Housing Authority and Northern New England Housing Investment Fund are collaborating on another housing project, this one geared toward seniors, next door at the former Brewer Middle School site. That’s a 28-unit project expected to open in fall. Village Centre is expected to open to tenants in April 2016.